Wednesday 1 August 2012 will live forever in the memory of all those who witnessed Bradley Wiggins's stunning Time Trial gold at the London 2012 Olympics. And this less than 10 days after his sensational Tour de France triumph, when he became the first Briton to top the podium. But Wiggins is not just famous for winning. His personality and style - his sideburns are so famous that tabloid newspapers were providing cut-outs for fans to wear on the morning of the Olympic race - have earned him the status of national hero. Wiggins is no overnight champion. He has been at the top of his sport for over a decade and this new illustrated book celebrates the life of this great man, who is now Britain's greatest-ever Olympian and road racer. As a kid, while his friends had posters of footballers on their bedroom walls, Wiggins idolised the great Spanish cyclist, Miguel Indurain, setting the scene for a career in the saddle. 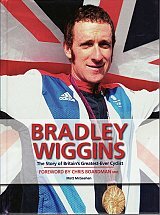 The book details every aspect of his rise to the top of his game, alternating between the twin disciplines of the velodrome - where he dominated the Pursuit events at the 2004 and 2008 Olympics - and the world of professional road racing, culminating in the magical summer of 2012. It looks at the hours of training, the great cyclists he has competed both against and alongside, life at Team Sky and the family life he now enjoys. Along the way, the full character of this most unusual of sporting champions is revealed in pictures, narrative and quotes. His outspoken comments on doping, his love of mod fashion and his witty, quietly spoken persona all combine to provide the complete story of a man who is already a legend.